​We talked nearly non stop about the ministry, ideas, practical steps, our horses and our excitement. It was late afternoon when we left the flat prairie lands and drove into the mountains. The views so stunning we all sat quietly, looking out at the wonder of western Montana. Around 7pm a call came into my phone, not recognizing the number I answered with my formal “Hello this is Caryl” in response, a sobbing, near hysterical voice. “He’s lost so much blood... there’s blood everywhere...he was like this when we got here...I don’t think he’s going to make it…” We dropped down into a valley and I lost cell service. I relayed to the group what had just happened, and waited for my phone to pick up a signal. As soon as I was able to I redialed and asked “Who is this?” “What’s going on?” “This is Amy from the barn...I don’t know what to do...You have to call the vet!” before I could answer she handed the phone over to another gal who more calmly began to fill us in on the details. Charlie, our 8year old partially blind Appaloosa, already diagnosed with uveitis, had injured his face near his left eye. It was probably fractured, he had lost a lot of blood and definitely needed emergency medical care. Ben pulled the car over and all of us with our phones out, began making calls and talking through our options. After a few unsuccessful calls Bridget, one of our mentors, came to mind, she had the experience, knew how to trailer and haul horses and praise the Lord, she was able to help. Several boarders and the barn owners helped Bridgette get the trailer hooked up and Charlie loaded in. Bridget called us to let us know she was on her way. The vet was over an hour away, we just had to wait and pray, We prayed for Charlie, and for wisdom. What next? Should we turn back? We all agreed that we needed to continue on our trip, and we felt confident that our volunteers could and would work together through this crisis. We prayed again, this time for Bridget, Charlie, Jeannette, our vet, and the other volunteers that were helping. My head was swimming, my heart was heavy and my stomach was twisted. I was trying not to cry or throw up. Wendi was doing the same. What ever made us think we could do this! Bringing in horses that were unwanted, abandon or disabled and give them a good, safe home and the job of reaching out to children, many of which have the same history. Defeat and doubt were hovering over us. But in due time, God’s strong peace washed over us, wave after wave. He was with us, for us and for this ministry. We were all waiting for an update on Charlie and had left messages with the vet and with Bridget. It seemed like forever before we finally heard the good news that Charlie would be okay. 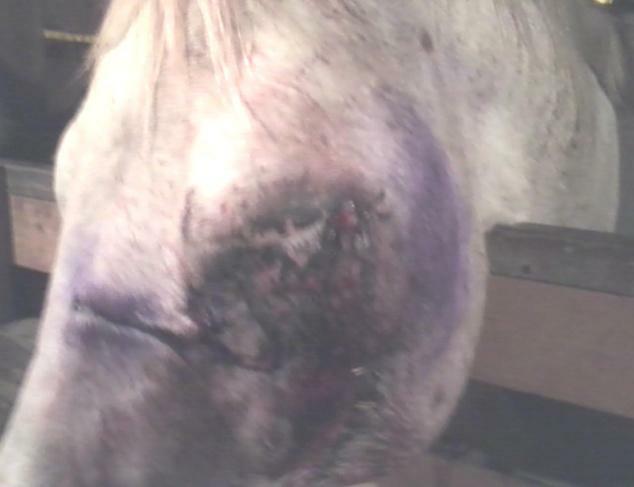 A bone fragment 3 inches long was removed from below the left eye, he was stitched up, cleaned up and back at the barn. Despite our distractions, we were amazed and encouraged by our first moments at Crystal Peaks Youth Ranch. We all filed into the meeting hall, found our seats and waited for it all to begin. Four days later, filled with answers, ideas and inspiration, we packed up our car and headed back home, all of us feeling confident that attending the conference had been the right choice. 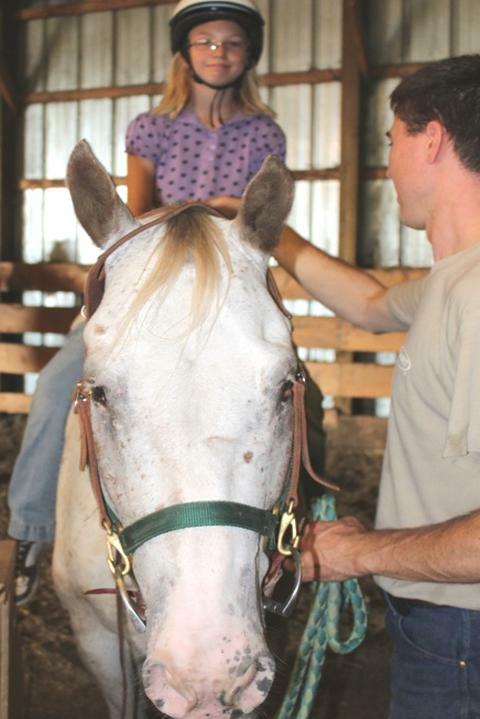 Arriving back in Grand Forks, we swung by the house to pick up Andi and headed over to the barn to see Charlie. As we moved Charlie into the arena so we could clean out his stall, he was shaking from fear or pain or both. Andi asked if she could stay with him while we cleaned. She was afraid to get too close, but didn’t want to leave his side. After the chores we gathered around to plan out a new care and chores rotation for Charlie. Looking up to check on Andi, we saw that our nervous, shaking Charlie was calm; he looked relaxed, maybe even asleep. Andi stood in front of him with her small hands cupped under his chin. She was singing and sobbing and loving Charlie. Tears were running down Andi’s face, and when she saw that we were all looking, she simply said. “Charlie needs me.” Ben and I glanced at each other, filled with emotion and gratefulness, we knew that it was true and that Andi also needed Charlie. Above Charlie is pictured, one week after his surgery. A month and a half later scars are softened and Charlie is with his friend Andi and their mentor Kirk.